ECIS 2015 Track | ERCIS Competence Center "Service Science"
Service management on both the business level and the IT level is a buzzing topic as is apparent in the increasing emphasis on the Service Economy, the promotion of Services Sciences, Management, Engineering and Design (SSMED) by IBM and others, the rise of Service Management in IT (e.g. ITIL v3), the developments in the area of Service-Oriented Architectures (SOA), and the growing importance of service as a sourcing model for software (e.g., Software-as-a-Service, SaaS). The hits on Google Scholar for the term “service science” have developed from 653 in 2006 to 4310 in 2013. More information is available at: http://ecis2015.eu. 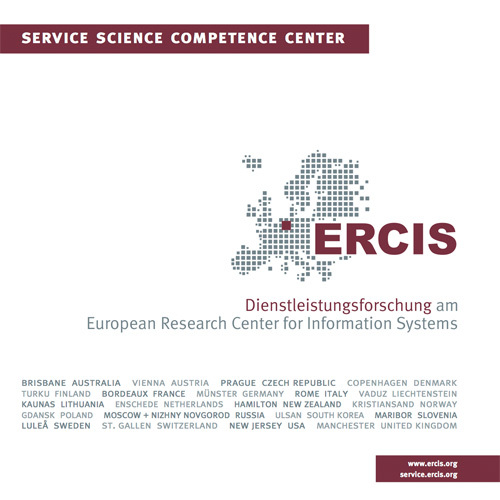 The ERCIS Service Science Competence Center is involved at ECIS by co-hosting the track on “Service Innovation, Engineering and Management”, in which Daniel Beverungen is involved as an associate editor. An increasing number of activities of public and private organizations are engineered and managed as services, often creating innovations for economic growth and social welfare. This development is mirrored in the domain of information systems, which becomes evident in the use of services as the organizing logic for providing information systems (IS), in the use of services as an architectural paradigm (SOA), and in the development of Cloud/Internet-based services for information, processes, applications, and IT-infrastructures. Moreover, the increasing amalgamation of ICT-enabled corporate and consumer services offer substantial opportunities for service innovation. Examples for augmenting the physical world with services include Near Frequency Communication (NFC) enabled frequent flyer cards at Air New Zealand that facilitate check-in and identity verification, mobile ticketing for public transportations, apps for music festival participants to interact with each other, or tablet-based services for ordering food and drinks at a casino or restaurant. Often, the focal points are the infusion of ICT into services and transferring service-dominant logic thinking into ICT development and use. The information systems discipline contributes to the interdisciplinary research stream of service since its first inception about 10 years ago. Currently, researchers and practitioners alike still suffer from a lack of theory-rooted knowledge for engineering and managing services as well as leveraging IS for service innovation. At the same time, the advent and success of the service paradigm challenges previously established concepts in the IS discipline, such as the separation between corporate IS and consumer IS, or internal IS and external services. The proliferation of a service society is an increasingly global phenomenon and marketplace that calls for relevant and rigorous research that reaches across traditional geographical and disciplinary boundaries. Service-focused research in IS thus needs to create and refine concepts, models, methods, and systems to reflect these developments.